“I always have my 4-H hat on … and these people and animals needed help,” she said. 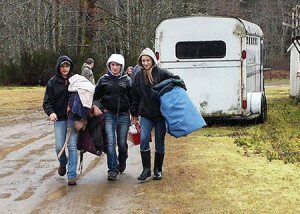 Jana Ferris, WSU Snohomish County Extension 4-H educator, said many 4-H volunteers and WSU livestock advisors sprang into action, loading and hauling livestock to get them out of harm’s way. Lilianna Andrews, 13, a member of the Snohomish County 4-H youth horse program, knew what had to be done; she helped rescue three of her family’s horses from the rapidly rising water. Her family’s house was directly in the path of the flooding Stillaguamish River. They were fortunate that no one was hurt and they managed to rescue their dog and all seven of their horses, but their house was flooded. They are living temporarily at a friend’s house in Darrington, Wash., until they know what their next steps will be. Ferris said the 4-H community was quick to respond to the Andrews’ situation – and those of other families – with donations of hay, feed and tack as well as household goods. Curt Moulton, director of WSU Snohomish County Extension, described 4-H as an empowered group of volunteers with a service ethic built in. 4-H is a WSU Extension youth development program that cultivates leadership and life skills among youth focusing on critical thinking, problem-solving and learning with an ethic of generosity. “4-H volunteers have worked with youth to examine this disaster and determine appropriate, and often creative, community service activities,” Ferris said. 4-H clubs throughout Snohomish County have responded to the Highway 530 mudslide with various community service activities. Clubs have raised money – at times matched by local business partners – contributed animal feed and grain, assisted in taking care of displaced and survivors’ horses and even folded freshly laundered clothing for responders. So far, over $15,000 in cash, gift cards and in-kind donations – feed for animals, household items and clothing – have been collected for the community. 4-H clubs around the state have also stepped up. The Fall City Flames 4-H horse club raised $310 in cash and delivered 10 bags of feed and more than a ton of hay to help feed animals impacted by the slide. WSU Snohomish County Extension and the WSU Office of Emergency Management are convening a team of faculty, staff and students to aid in long-term recovery efforts for residents affected by the mudslide.